This is getting a little serious now. 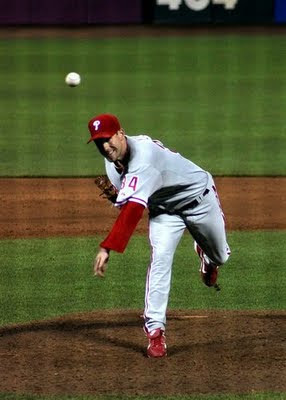 The Phillies can't score a run against the Houston Astros and a pitcher named Wandy. Yes, not Cy, but Wandy. Furthermore, the pitcher that came into the club and immediately grabbed the 'ace' status pitched one of the worst games yet in a Phillies uniform for him. Yes, there were some bloops, some broken bats and some other assorted bad luck, but this is baseball and it's starting to get late in the season for the Phillies. The Phils will probably make the playoffs, that seems to be a lock. Barring too many more performances like this one last night though. As Larry Anderson said on the Phillies baseball radio broadcast, "What's happened to the Phillies offense?" Gary Matthews interviewed newly added pitcher Brett Myers on the pregame radio show yesterday. Gary: When you get a chance to see the club from a far, do you kind of get a different take on exactly how these guys operate? Brett is happy to be a part of the bullpen, and he was expected to get some time in the game last night, but that never happened in the 7-0 loss.